New flight from Edinburgh to Beziers airport. Tickets now on sale. 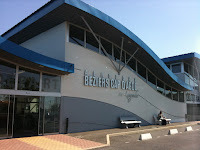 Ryanair's new flight from Edinburgh to Beziers airport opens it's doors on March 31st 2013. Tickets for this flight from Edinburgh to Beziers airport are now on sale via the ryanair website - www.ryanair.com - with ticket prices starting at just €35.